The Enchanted Kitchen. Photo Credit Brittany Trott. A raw food diet includes more than just carrot and celery sticks. Rather, envision a pile of raw zucchini noodles topped with garlic scape pesto, bell peppers, and sesame seeds. Or how about a kale salad with Thai curry pineapple crème, sugar snap peas, and green onions? These are the kinds of dishes you will find at The Enchanted Kitchen, a new café in on Pugh Street in downtown State College. The menu changes daily depending on what fresh ingredients are available from local vendors like Jade Family Farm, Pantheon Teas, Gemelli Bakers, Howards End Farm, and Full Circle Farms. The café also serves organic, whole foods. And for owner and chef, April Myers, the road to opening the café was truly organic, as well. April has always been conscious of what she puts into her body, and five years ago, she transitioned into a raw food diet. Since going raw, April has worked as a personal chef. She has hosted a whole foods stand at the Downtown State College Farmers Market, and she has managed the kitchen at Webster’s Bookstore Café. But in the back of her mind, April always dreamed of opening her own café. So when Karen Sapia, a seven-year yoga instructor, asked if she was interested in a business partnership, April jumped at the opportunity. 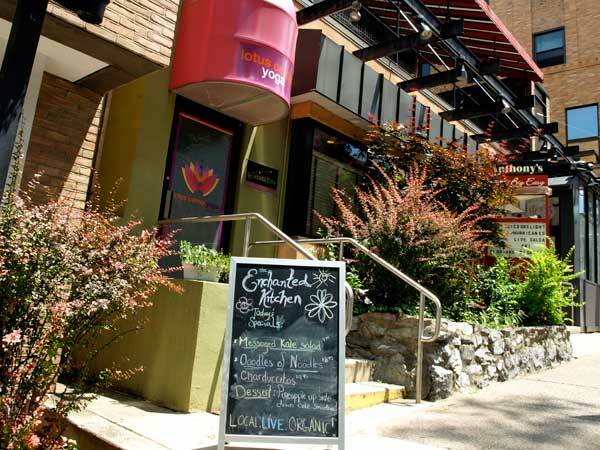 Walking down the stairs into The Enchanted Kitchen, you will find a Zen style café and yoga studio. The lights are dim and the music is mellow. The café celebrated its grand opening one month ago today. On May 22, over 300 people showed up at The Enchanted Kitchen, and its client base has been growing ever since. April understands the importance of supporting her community and eating local food. She is completely involved in choosing all of the food she serves at the café. In fact, she is able to tell you who grew and harvested each bite on your plate. And if you have a question about your food, no problem. April can provide you with a phone number so you can call the vendor directly. What did I eat on my first visit to The Enchanted Kitchen? I ordered the Chardurritos: two big beautiful leaves of rainbow chard stuffed with sunflower seed paste, nutty avocado, and diced sundried tomatoes and drizzled with spiced fig dressing. My meal was delicious and filled with so many wonderful flavors. And don’t let all that green fool you, the chardurritos were incredibly filling. 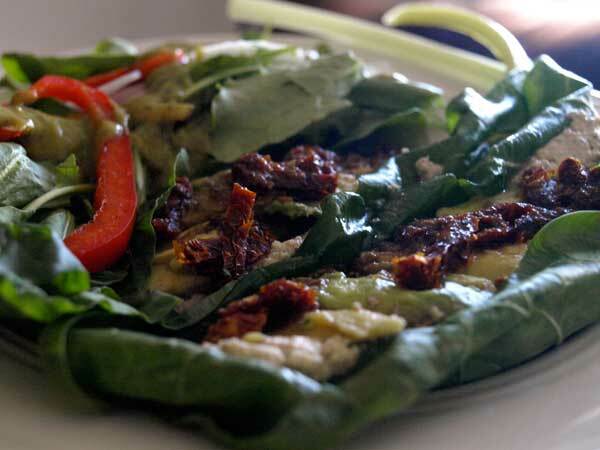 Rainbow Chard with Sunflower Seed Paste, Avocado, Sundried Tomatoes and Spicy Fig Dressing. Photo Credit Brittany Trott. 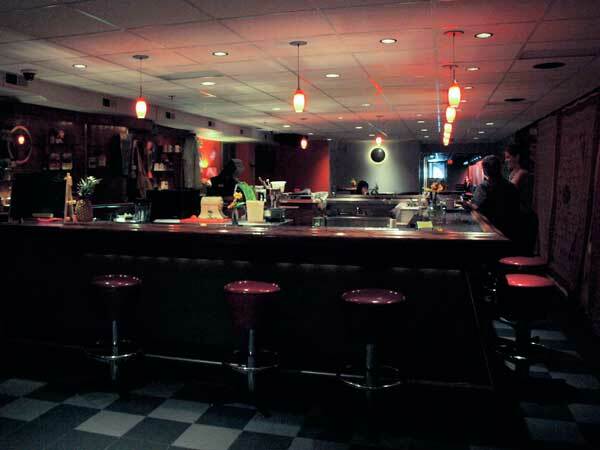 So I encourage you to stop by the café and enjoy a tasty, healthy meal at the bar or at one of the intimate tables. Or order and take away. Or take a yoga class then sit down with friends and sip a smoothie. Just remember to bring cash, the café doesn’t accept plastic (yet). However you decide to enjoy The Enchanted Kitchen, know you are directly supporting your community and, in the end, your body will thank you, too. Delighted to see such a mindful combination of ideas at the old stomping grounds. There is a nice cookbook entitled ‘Raw Food/Real World’ for those looking for a peak into this style of preparation. I will be by to sample the fare soon.